On the 10th of December 2018, Mr. Benedek Javor MEP, the vice chair of the Committee on the Environment, Public Health and Food Safety of the European Parliament, submitted a written question to the European Commission about the sustainability proofing of the E40 Inland Waterway. Mr Javor’s question is requesting an important information because the economic, ecological and social sustainability of the suggested new waterway is not proven through its 2015 feasibility study, which was co-financed by the European Union. “Polesia is Europe’s greatest intact floodplain region, which comprises large forests and wetlands and boasts high biodiversity and great potential for climate mitigation. The development plan for the E40 inland waterway, a navigation route to link the Black and Baltic Seas, poses great threats to the natural resources and the health of citizens living in the region — especially those surrounding the Pripyat river. 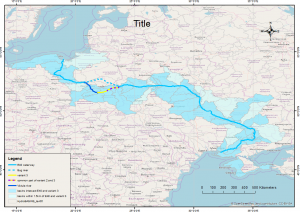 The E40 would go through the Chernobyl exclusion zone and potentially mobilise radioactive sediments, thereby threatening drinking water resources and the food chains of millions of people downstream. It would also have a negative impact on 7% of Poland’s Natura 2000 sites and a total of 25 400 km2 of protected areas, including important migratory bird habitats. A feasibility study was conducted, supported by the EU’s European Neighbourhood and Partnership Instrument (ENPI), but the results have not been made public. Some 25 000 people signed an online petition to stop the E40, and several European organisations have argued against it because of compelling reasons to maintain sustainability. Will the Commission use all its tools to ensure that the E40 development does not endanger wetlands and citizens in Polesia? The question and the European Commission’s response will be available here.